Shop Hosa Unbalanced Interconnect 1/4" TS Cables from AMS and enjoy Fast & Free Shipping. 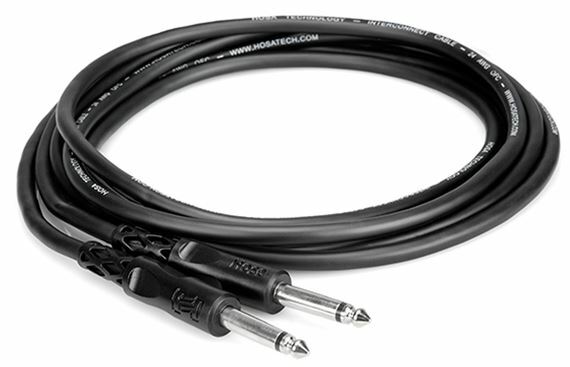 Connect pro audio gear with the Hosa 1/4 Inch Unbalanced Interconnect Cable! This cable is ideal for use in a variety of professional and consumer applications where 1/4 inch TS phone jacks are needed. Oxygen-free copper conductor provides enhanced signal clarity. What a surprise! I have been using a Marshall 4x12 8ohm speaker cabinet that was loaned to me with my Behringer 300w Ultrabass amp head after my cab failed. Initially there was a bit of hum and hiss with my Mustang. I became concerned. My lead guitarist suggested I try this cable from AMS first. I received it and swapped cables from my amp to the cab and all of hum and hiss disappeared. All for a less than $6 3' patch cable. Once again AMS has come through. Great cable well manufactured and very sturdy. Keep up the good work AMS you have been 100% through everything so far. WORKED OUT GREAT, JUST THE RIGHT SIZE. LOVE THE 5" LENGTH, JUST WHAT I NEED FOR THE PROJECT IAM WORKING ON.